Port of Morocco, Africa, on the Atlantic ocean. The Jewish community, numbering 6,000, in a total population of 20,000 inhabitants, is of recent date. The majority of its members are engaged in commerce in grain, spices, etc. ; there are also a few tinsmiths. The community is governed by a council of administration, which aids the poor and subsidizes the schools with the revenues from the meat-tax, and with the voluntary contributions of its members. Besides the two schools supported by the Alliance Israélite Universelle, with 295 boys and 161 girls respectively, Casablanca has eight Talmud-Torahs with 500 pupils. Casablanca possesses eleven synagogues, one of which, a synagogue for the poor, was erected about 1750, and another, the Synagogue Eliaou, about 1800. 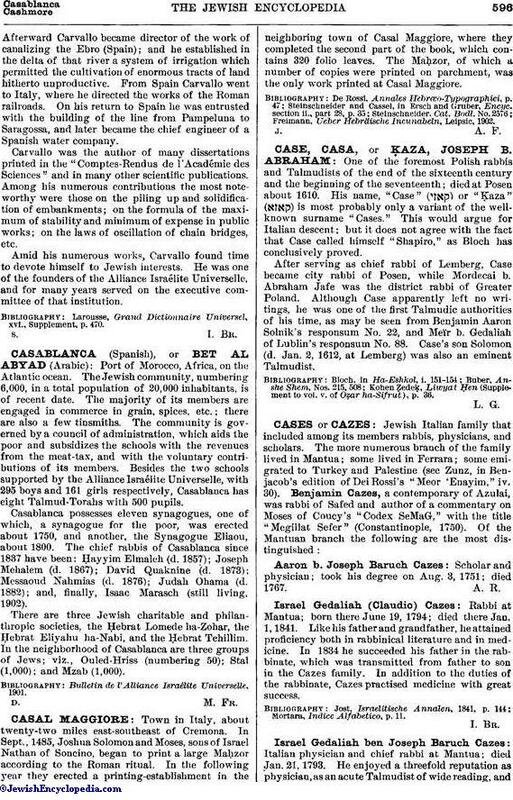 The chief rabbis of Casablanca since 1837 have been: Ḥayyim Elmaleh (d. 1857); Joseph Mehalem (d. 1867); David Quaknine (d. 1873); Messaoud Nahmias (d. 1876); Judah Ohama (d. 1882); and, finally, Isaac Marasch (still living, 1902). There are three Jewish charitable and philanthropic societies, the Ḥebrat Lomede ha-Zohar, the Ḥebrat Eliyahu ha-Nabi, and the Ḥebrat Tehillim. In the neighborhood of Casablanca are three groups of Jews; viz., Ouled-Hriss (numbering 50); Stal (1,000); and Mzab (1,000). Bulletin de l'Alliance Israélite Universelle, 1901.